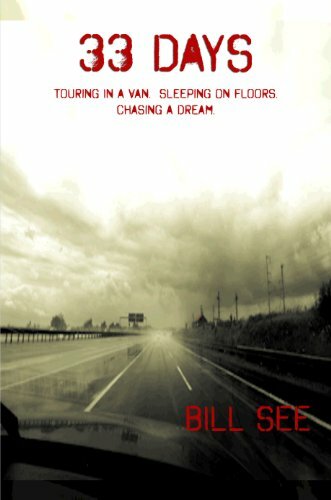 Ana Mardoll's Ramblings: Author Interview: Bill See on "33 Days"
Ana: Today we have Bill See introducing his novel, "33 Days: Touring In A Van. Sleeping On Floors. Chasing A Dream". I haven't read this book myself, but Bill was kind enough to agree to guest blog about the book to any readers who might be interested in the subject. Bill, how would you describe your novel to your prospective readers? In broad terms, what is your novel about? Bill: "33 Days" is a coming of age, on the road story about an indie rock band's first tour in a beat up old van across the U.S. and Canada. No soundman, no roadies, all they have is their music and each other’s friendship. They beg from the stage for a floor to sleep on and are never sure they’ll make enough gas money to get them to the next town. "33 Days" captures the essence of what it is to be out of your own for the first time in your life and chase a dream, back to a time in life when dreams don’t have boundaries, when everything is possible. The tour is one of those now or never experiences. Take a shot at making the band work or leave it all behind and go your separate ways. Every one of us has that moment where we have to decide to either live our dreams or give up and regret it for the rest of our lives. "33 Days" touches that part of us. Out there the road is filled with yuppies, brothels, riots, spiked drinks, DJs with no pants, and battles with racism. They set out on the road to discovery to drink in all they could and maybe sell a few records. They grew up instead. Bill: At its heart, it's a story about friendship held together by the shared discovery of the healing powers of making music together. Individually, these guys are losers. But together they believe they’re capable of great things. It’s not that they believed that music could change the world, but it did change theirs. It saved them. They'd all been living a lie, living someone else's dream. Things had become desperate at home and they've all come to that moment at the crossroads where you have to decide to live your dreams or sigh in resignation and toe the line like everyone else. And I think they've all realized something very sinister and irreversible happens when you sit on your dreams and deny what's at your core. In the end, it's as much about summoning the courage to try and go out and make it as it is a cautionary tale about the perils of sitting on your dreams. Who's it for? Well, I guess I had two age groups in mind. One was where I am now which is in my mid-40s. I wanted people who read "33 Days" to sit up in the middle of their lives and look back and ask themselves, "Did I fire my shot? Did I seize my moment?" And it's also for anyone in their late teens or early 20s facing their future and standing at their own personal crossroads of their lives. Bill: Well, it's twofold. It's, in part, culled from the journals I kept while my band Divine Weeks toured in a van back in the 80s. That makes up the majority of the day by day events of the tour. And what was extraordinary about finding those journals was the voice I'd written in at the time -- the voice was so electric and alive, and running over with that glorious mix of bravado hiding sheer terror that's so a part of the fabric of someone finally liberated from madness and hitting the road for the first time in their lives. I did everything I could to retain that voice and not add any acquired wisdom. The book is also based on a letter I wrote to my sister who'd been given up for adoption at birth and then reappeared in my life about 12 years ago. She'd asked me to write her something to explain what she'd missed growing up with our mother. So, that letter is a large part of the first chapter of the book and details the motivations for the discovery of music as a form of salvation from the madness I grew up around and the impetus for summoning the courage to go on that first tour. Ana: If you could compare your novel to any other existing works, which ones would it be and why? If the one thing you could say to a prospective reader was, "If you like X, you'll love my book!” which work would be invoked so that a reader could judge whether or not your novel is their cup of tea? Bill: 33 Days has been called a "quest" novel, and it's certainly a coming of age - on the road - book. When we climbed in the van, we set out to have our own Kerouac "On The Road" experience. So, when I sat down to write "33 Days" I wanted to write something you'd go searching for after reading "On The Road" and wanted more journeys that go off the map. The other thing was I wanted to dispel some of the myths about what's it's really like to be in a band. Ninety-five percent of us never get out of the garage. Another 4% that do get out of the garage never get more than a marginal amount of success. And 1% end up superstars but everyone assumes that's what it's really like. You know, the Learjets, the groupies, being on the cover of Rolling Stone. That's not reality for the overwhelming majority of us who play for love of music, not for profit margins. Music is our lifeblood and we play because a crucial part of us dies when we don't. Bill: This is my first book. I am, first and foremost, a musician. A lifer. But I've always journaled and have been sitting on this story for a long time. I guess you could say it started hurting too much not sharing it. I've got a few more ideas about where to take this for a next book, but right now I'm fully committed to promoting "33 Days" and possibly turning it into a movie. Bill: 33 Days is available on Amazon, B&N, Smashwords, and on Apple's iBookstore. I answer every email personally at bsclerk@earthink.net. Follow me on Twitter @33days, or like 33 Days on Facebook. The 33 Days website is here. The book trailer is also there on the book's website along with other videos, photos, interviews and music that's kind of a nice companion piece to the book. And I've got a blog here. Ana: Thank you, Bill. I understand you have the first chapter of your novel available as an excerpt for interested readers? And is there anything else you wish to add for our readers? Bill: Thank you Ana. Yeah, folks can go to the 33 Days website and click on the "Book Excerpt" tab or just click here to check it out.